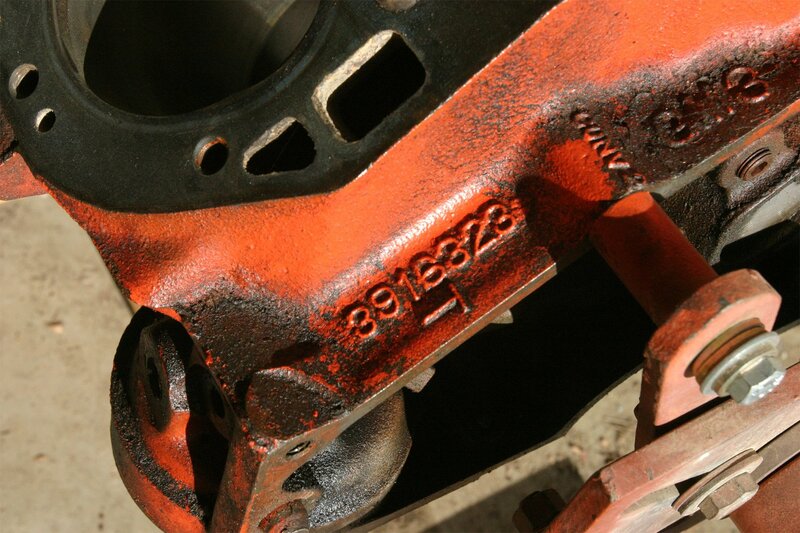 Weld strength and the quality of the materials used is critical in constructing a custom intake manifold. Take a look at nearly any high horsepower racing engine and one of the first things you’ll likely notice is the intake manifold. 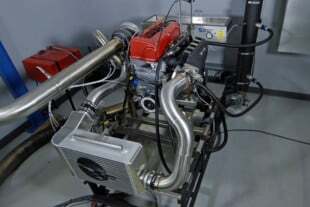 High horsepower cars from classes like X275, Pro Modified, Pro Stock and others, rely on manifolds that are not the typical out-of-the-box, or direct from a mail order catalog pieces. They are custom-built and custom-tuned components that take into account the entire vehicle package. We talked with two of the big players in the custom intake manifold market, Wilson Manfiolds, and Berry Motorsports, to get an idea of what goes into the design of a custom intake manifold. With sanctioning bodies’ ever-tightening rules, racers and engine builders are looking for every last horsepower advantage. In the past, the intake manifold may have been only an afterthought, something that was hand ported, or an out-of-the-box part. Most of us know the more air that can get into an engine, the more fuel it can burn and theoretically the more horsepower it will make. The intake should be designed to enhance the capability of the cylinder head. If the intake is a flow restriction, even the best designed cylinder heads with massive flow potential won’t be enough to maximize engine power. Custom built intakes cover a wide variety of applications. We utilize an intake custom built from Wilson Manifolds in our Project BlownZ 275 Radial Camaro. The process of building a custom intake manifold starts with the design phase. Like any other critical engine component at this level of racing, the intake manifold must be carefully designed to work in conjunction with other engine components. 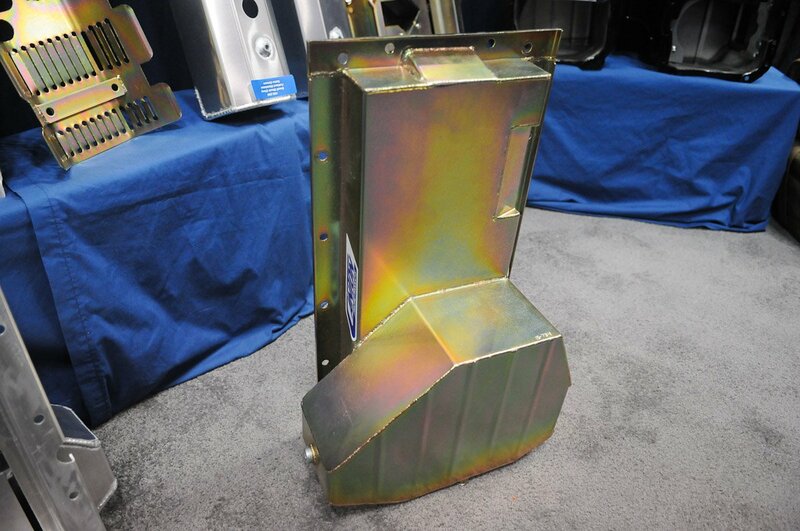 This custom intake elbow can direct incoming air flow dividing it between the cylinders to optimize air distribution. Manifolds are typically designed using specialized CAD software. This allows for the best optimization of airflow and dimensions. It also allows the designer to see problem areas at the engineering level before any metal is ever cut for an intake. Runner design is the most critical component of intake design. Both Wilson Manifolds and Berry Motorsports request that customer’s send their cylinder heads to them for the intake build process to begin. “Once we receive a customer’s cylinder heads, we’ll flow them to get an idea of where the intake needs to perform,” says Mansfield. Overall volume is not the only aspect considered. The velocity of air flow, and maximizing the head’s performance potential via changes to the incoming air are also scrutinized during this portion of the design phase. The reason for an intake builder requesting a set of heads is due to the differences in port work on nearly every set of heads. At this level of racing, engine builders are also not utilizing straight out-of-the-box cylinder heads. Since no two company’s cylinder head porting practices are identical, each set of heads is unique. 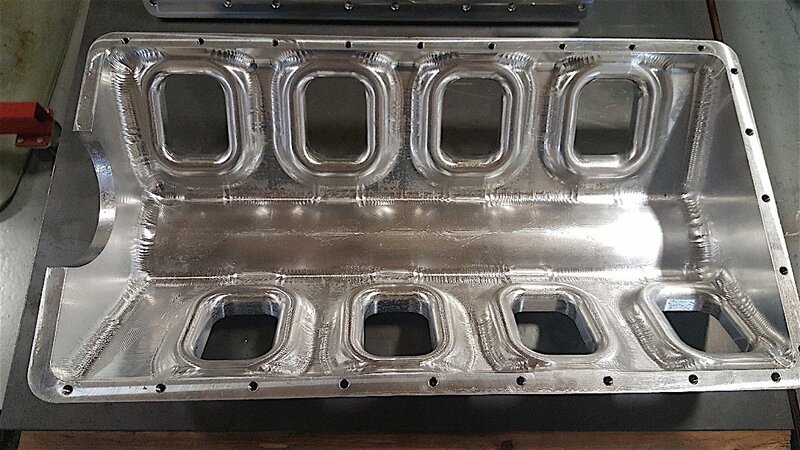 That uniqueness translates to a need to custom tailor each set of intake runners to the specific cylinder heads, rather than a one size fits all approach. Left: Having the heads off the vehicle is critical for designing and building a custom intake. Not only is it critical to port shape, but also for finalizing all of the design aspects of the intake. Right: Mock up and fitting are integral to the design and construction process. If the shape of the intake runners, as well as their size and volume is not matched precisely, then several problems can occur. One is that the incoming air flow velocity to each intake port could be reduced too much. A port shape or size mismatch could also cause the incoming air to become more turbulent, limit the available volume of air, or alter the flow characteristics of the incoming air. 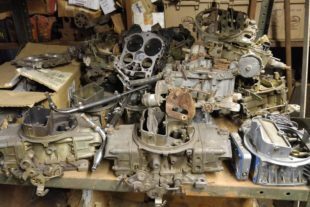 Any of these issues could cause a loss of engine performance. You will often read about or see advertised runner volume, but equally important is also runner shape. “Runner design comes from the heads,” says Berry. This goes back to why an intake designer will want an engine’s cylinder heads in order to develop a custom intake manifold of this level. Runners are often designed with some taper to help increase velocity as airflow approaches the cylinder head. This taper is the transition between the cylinder head port and the intake plenum, and it also serves to help the runner match the exact shape of the intake port. “Ideally you want a round runner shape,” says Mansfield, noting that this is not always possible, and is all dictated by the cylinder head intake port shape. According to Mansfield, the reason for a round shape being more desirable than a square or rectangular shape is the way that they see air react with certain designs. 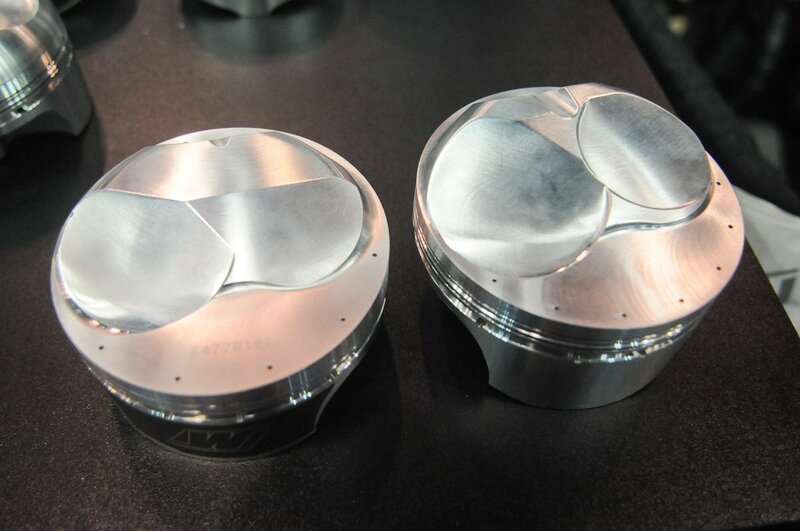 “Corners or angles can create small vortices within the manifold that will affect the airflow,” says Mansfield. Left: According to Berry, shorter runners will tend to generate more torque. Right: Longer runners like those on the intake for BlownZ will generate more upper RPM horsepower. Typically a longer design is more desirable in a drag racing intake, but it all boils down to optimizing the intake for the application. Runner length also plays an important role. According to Berry, shorter runners tend to develop more low end torque, “More torque makes it harder to get down the track,” says Berry. So most manifolds for drag racing applications will utilize a longer runner design. By tuning the runner to a specific length, intake designers can work directly with the engine builder and racer to optimize the intake for the engine’s desired power band. An intake manifold for a Pro Stock car is going to have a different runner length and taper than a forced induction Pro Mod car. Wilson also points out that they take into consideration how the cylinder head flow responds to different runner designs. Various shapes and lengths can have an affect on not only the volume of air that the intake port of the head will potentially flow, but also on its velocity and how quickly the port can be filled. They work within the boundaries outlined by the engine specifications, as well as the rules of the class the car will be participating in to optimize intake runner design for each cylinder head port. This allows the heads and intake to work together as a system rather than just two separate components. Berry mentions that with custom intakes, the volume of an intake plenum generally matches the displacement of an engine. This means if an engine displaces 500 cubic inches, then the volume inside the plenum is typically going to also have a volume of around 500 cubic inches. Under this type of design, ideally no cylinder is starved for air because the volume inside the plenum is enough to fill all the cylinders simultaneously. If the volume of the intake plenum is not properly matched and is too small for the application, an engine could develop a stall or sluggish response from an engine at the starting line or after each shift, as combustion events literally draw all the available air from the manifold faster than it can be filled by incoming air. Engines with too small of a plenum may perform well at lower RPM but suffer as RPM increases. The humpback design of the upper plenum on BlownZ is designed to slow down the velocity of the incoming air charge, allowing it to turn into the first two cylinders, but also allowing it to fill the cylinders towards the rear of the intake. A plenum that is too large for the application could also cause too great a loss of velocity as the incoming air is slowed too much when it enters the plenum. This again results in a lack of power as the intake ports and cylinders won’t fill as fast as possible. A lack of velocity can also result in sluggish engine response – especially in the lower RPM range – and an improper air/fuel ratio. According to Berry, the overall shape of the plenum lends some flexibility to design needs. This goes back to the issues of clearances and aerodynamics. Whether the plenum is wide or tall, Berry says they’ve seen no differences in how an engine performed. In many forced induction designs, Wilson manifolds incorporates what they refer to as the humpback. This shape helps better manage air as it comes into the plenum, slowing it down and allowing the cylinders to fill evenly. Better air management will often translate into better performance and engine life. Space constraints and hood clearance can sometimes dictate the shape of the upper plenum in terms of is it taller or wider. A key player in manifold design is whether an engine is naturally aspirated, or uses some form of forced induction. Naturally aspirated engines tend to be far more sensitive to the smallest design changes than forced induction applications. These minor changes become even more critical in tightly restricted naturally aspirated classes such as Pro Stock where races can be won or lost by minor differences in horsepower. 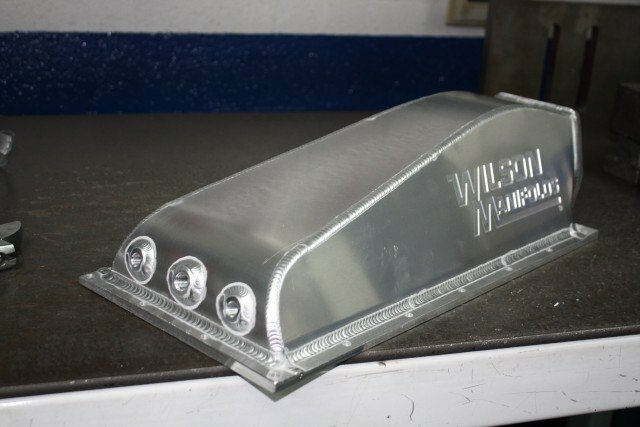 This intake from Wilson Manifolds incorporates the nitrous components, burst panels, and all of the throttle linkage brackets into the design. “With a Pro Stock engine, every change you make in the design you can see on the dyno,” says Mansfield. This makes optimizing the intake design that much more critical. This is where experience for a company like Wilson Manifolds pays off. “A difference as small as 1/64th of an inch can have a significant impact on how that manifold performs. This is in part due to the extreme RPM and narrow power band that Pro Stock engines operate at. With valve events occurring so closely together, tuning the intake to work properly within the pressure waves that occur during valve opening, as well as other intake events becomes critical. When dealing with carburetors such as the split Dominators used in Pro Stock, lining up each individual venturi with an intake runner so that every cylinder is fed in an identical manner is also a critical point of design. In naturally aspirated applications that work at lower RPM’s such as a top sportsman car, minor changes to the intake have less impact on the total performance. The same holds true in a Pro Modified situation where horsepower is critical, but intake performance does not have to be dealt with in terms of such a narrow high-RPM operating range. Over a decade ago Wilson Manifold’s Nitrous Pro-Flow division developed the first ever nitrous burst panels. These are designed to protect critical components in the event of a nitrous backfire. They work by alleviating the sudden high pressure that occurs during such an event. They are IHRA approved, meeting the requirement for such protection. There are two types, the spring style pictured here, which require no service after runs since they automatically reset, and the original membrane style. The membrane style burst panels can be quickly replaced. If a backfire occurs, new panels can quickly be installed to get the car ready for the next round. Typically the spring style are incorporated into an intake manifold design, while the membrane type are available as part of a Nitrous Pro-Flow carburetor spacer, or nitrous plate. Forced induction manifolds tend to be more forgiving than naturally aspirated manifolds in terms of their tolerance to design change. Boost pressure filling the manifold plenum typically keeps the engine well fed from the time it leaves the starting line until it shuts down. A forced induction intake must be able to withstand the pressures applied to it. This makes materials strength critical. “We use 6061 billet aluminum,” says Berry. Wilson would not reveal to us the exact alloys they use in their applications. Mansfield would only tell us that they were Aerospace grade metals, and the exact material used would be dictated by the specific application. According to Mansfield, most naturally aspirated applications use thinner, lightweight materials because these cars are concerned with every ounce of weight. While forced induction racers are also concerned with weight, strength must take precedent when constructing a manifold for a forced induction engine. “The welds must be of the highest quality,” adds Mansfield. The intake manifold is being pressure cycled repeatedly during a pass down the drag strip, and whether turbocharged or supercharged, there will be changes in boost pressure throughout the run. The pressurized air is literally looking for a way to escape from the manifold. This continual cycling of pressure can cause a manifold to distort or even fail if it is not constructed properly. Couple this with the vibration from engines of this caliber and materials failure is something that all manifold builders are concerned with. Additionally something as minor as a poorly attached, or poorly designed fuel rail mounting tab could have major implications if it were to fail and cause a fuel leak. The same holds true for the attachment points for nitrous components, throttle linkage, or any other component that must hang from the intake. These pieces need to attach securely with little chance for failure. Berry Motorsports only deals in intake manifolds for forced induction applications. They offer something to their customers in the way of manifold tuning that is unique. They construct their billet manifolds as a bolt-together o-ring sealed design. This means that the runners can actually be swapped. 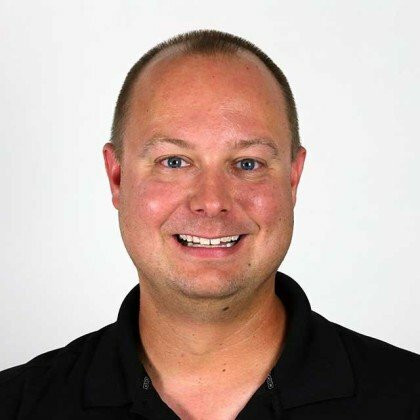 “If you need to make the change to running more than one injector per cylinder, or just need a different runner length, you can do that without the need to buy an entire manifold,” says Berry. Berry Motorsports designs their intakes with a modular design, allowing owners to make changes to the runners for length or injectors, without having to replace the entire intake manifold. What this means for customers is, that if a racer is upping their game for next season and need to add an additional set of fuel injectors, or change intake runner length to alter engine performance, they have options to make this happen from a more cost conscious standpoint. Manifolds are constructed primarily from aluminum. In the case of custom manifolds, this is from cast, billet, sheet aluminum, or any combination of the above, such as on BlownZ. With modern CNC technology, many of a manifold’s components can be made on a CNC mill, then assembled by hand. 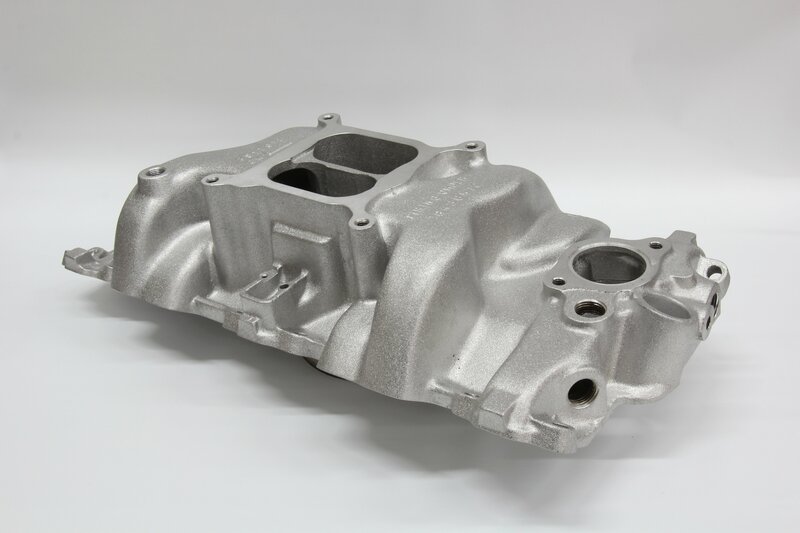 Weld strength and the quality of the materials used are critical in constructing a custom intake manifold. Components are often built using custom jigs and fixtures, and mocking the parts up to the heads on a test block or stand is something that occurs repeatedly throughout the build process. Quality control is key in this type of work, and each builder pays close attention to every aspect of the build throughout the construction process. Each manifold can take up to two weeks to design and another six to ten weeks for delivery, provided there is not already a back log of orders in front of yours. In the highly competitive environment of drag racing, racers look for every advantage possible. Having the intake manifold optimized for a particular engine combination is one more way to maximize an engine’s performance and get to the finish line faster.